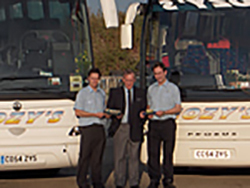 Cozy's is a family run coach hire business based in Letchworth Garden City, Hertfordshire. We are within fast and easy access of the Motorway network, conveniently close to both the A1(M) and M1. Our vast amount of experience and expertise enables us to provide you with an enjoyable and safe travel experience. We understand how difficult it can be to organize a large group to travel and meet every requirement. We have an experienced team at hand ready to discuss your needs and help make your task easier. Our well-maintained coaches have won awards for their high standards of comfort and safety. Our large and diverse fleet means that whatever your requirements, we are able to provide the most suitable coach for you. You can hire a coach for an hour, a full or half day, or just for an evening, or any amount of time you need. We can provide transport for all occasions from local trips to long distance. 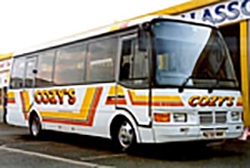 Cozy's began in 1984 as a one-man taxi hire business. 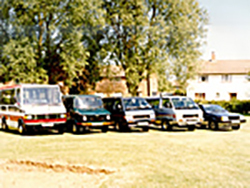 Over the next few years this increased to include small mini-buses and later progressed to larger mini-buses and coaches. As the number of vehicles and employees grew, so did our reputation, and the taxi side of the operation was phased out in favour of the coach business, due to the increase in demand for our services. Thanks to our high standards of care and maintenance, high quality coaches and experienced professional uniformed drivers, before long we were providing tour buses for celebrities, team buses for football teams and coaches for government bodies, local councils and schools as well as countless other organisations. As time went on we increased our fleet to include a wide variety of vehicle sizes and specifications, from luxury executive coaches to specially adapted vehicles for wheelchair access. Every year we invest a large amount of revenue in the business to ensure that we can constantly upgrade our fleet with the most modern, safe and high specification vehicles.